Today the Sun forms a grand trine with two minor planets: Echeclus (currently in Taurus) and Orcus (in Virgo). Rather aptly for the time of year, this pattern speaks to the effect of words in general and oaths in particular. Often, if we make a serious resolution, its power can change our lives in ways we might not foresee. Today’s Birthdays: Jacques Cartier (1491-1557), Simon Forman (1552-1611), Giovanni Boldini (1842-1931), Elizabeth Arden (1878-1966), Henri Matisse (1869-1954), Jule Styne (1905-1994), Simon Wiesenthal (1908-2005), Jonah Jones (1909-2000), Odetta (1930-2008), Anthony Hopkins (1937), Andy Summers (1942), Ben Kingsley (1943), Connie Willis (1945), Donna Summer (1948-2012), Bebe Neuwirth (1958), Val Kilmer (1959), Nicholas Sparks (1965), Junot Diaz (1968), Psy (1977). Today’s Oracle takes us to the Capricorn weekly for Feb. 4, 2000. Here is a really cool trick you can learn this week in about half a snap of a finger: giving to yourself. That’s another way of saying being, or rather, learning that you are your most lucrative resource. You will learn through experience. Some perplexing situation, stuck area of your life, financial difficulty or question of fundamental values in a relationship is likely to present itself (they always do) and you have the chance right now to look at yourself in a truly new way, turn the problem into an asset, and discover that there is a whole bunch more to you and in you than you might have realized. In a not-so-catchy phrase, instability is an opportunity not to withhold from yourself. The Oracle is a daily mini-reading divined from our extensive Horoscope Archive. 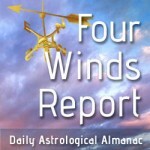 You can research any Planet Waves horoscope published since 1999 at the Horoscope Archive and Oracle. Moon Phase: Moon is in Waxing Gibbous phase and enters Full phase on Jan. 1-2 at 6:24 pm PST / 9:24 pm EST (02:24:00 UTC). Corresponding New Moon in Capricorn is on Jan. 16-17 at 6:17 pm PST / 9:17 pm EST (02:17:09 UTC). Moon Sign: Moon is in Gemini and enters Cancer on Jan. 1 at 12:10 am PST / 3:10 am EST (08:10:01 UTC). — Mercury trine Ceres at 2:52 am PST / 5:52 am EST (10:51:36 UTC). — Venus conjunct Hylonome at 6:02 am PST / 9:02 am EST (14:02:14 UTC). — Makemake square Orius at 6:19 am PST / 9:19 am EST (14:19:23 UTC). You will need to adjust some of your life patterns this year, and you may find this easier than ever. This includes mental attitudes, exercise and diet habits, and balancing work and play. The planets are aligned in such a way that will remind you change is not just possible; it’s within reach if you’ll make the effort. And it will be worth meeting the challenge. Today the Sun forms a grand trine with two minor planets: Echeclus (currently in Taurus) and Orcus (in Virgo). Rather aptly for the time of year, this pattern speaks to the effect of words in general and oaths in particular. Often, if we make a serious resolution, its power can change our lives in ways we might not foresee; it may also allow you to keep to your determined course when everything else seems to be against you. This kind of gravity is all but lost to our present culture in the permanent distraction of the internet. Should you wish to manifest it within your life, be sure to do it due honor by choosing your promises carefully.